I saw the use of kiwi in buttermilk pancakes in a local women’s magazine, but I didn’t note down the recipe, but I knew it used buttermilk. It was very pretty. Traditional butter is made by letting the milk sit and ferment before churning, and the fermented liquid residue after churning is buttermilk. It’s in a fermented form, so it’s sourish and acidic. If you make your own 'buttermilk' by separating your cream (either by beating or shaking and not by culturing), the liquid residue is not sour, due to absence of bacterial activity. If your homemade buttermilk isn’t sourish, how can it react properly with baking soda to give it that infamous softness and fluffiness? So, I’ll still stick to yogurt + milk, if I need a good substitute for this so that I can get the similar viscosity. But then again, I've tried using yogurt with this same recipe, it doesn't give the same results, it's much less favourable. I know some people will say, can just substitute with soured milk, that is milk+lemon juice/lime/vinegar. But to me, the result is not the same. The result of soured milk pancakes is similar to those made from yogurt, furthermore, the viscosity is not there. It makes the pancakes spread and thus, less height. There was no turning back after I tried buttermilk, as in real buttermilk, not soured milk. 2 kiwi fruits, each sliced into 5. 1. Heat a non stick pan and heat the butter until just melted. Let it turn warm. 2. Sift cake flour + baking soda + baking powder together. Mix in sugar and salt. Set aside. 3. Mix egg with buttermilk. Mix in melted butter. 4. Pour (3) into (2) and mix until combined but not smooth. 5. Heat the pan (used in 1, no need to wash) and put in one slice of kiwi. Top the kiwi with 1 heaped Tbsp of batter. Cover pan with lid (if you have, if not it’s ok) and let it cook on medium low heat. 6. When the rim of the pancake has cooked (solidified), flip the pancake to cook the other side, take care not to dislodge the kiwi. 7. Repeat cooking process until batter is used up. *Note: you can either reverse the batter/kiwi procedure, meaning batter first, kiwi on top. Works the same but there is a risk of the batter covering the fruit when you flip. 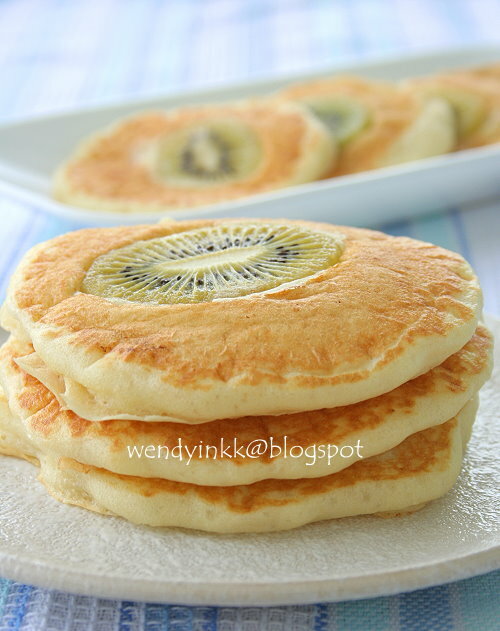 **I made some with bananas because Lyanne doesn’t take kiwi. One note about the colour of the kiwi fruit. Mine were quite green before cooking, and they all turned yellowish later. 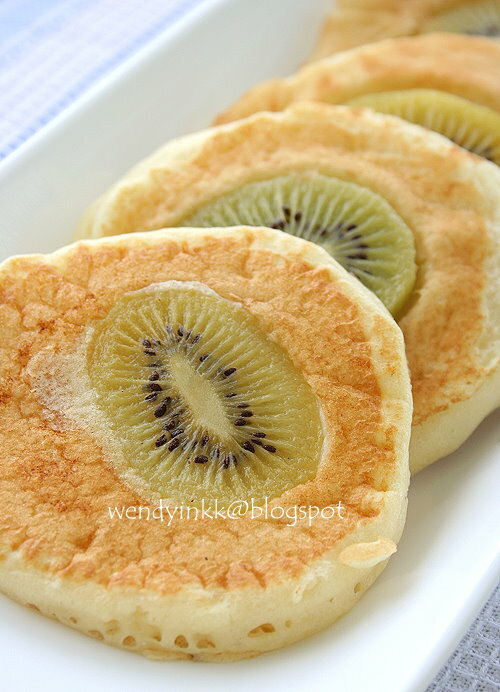 The picture of the kiwi pancake in the magazine was still brightly green, hmm... did they edit the pics or did they brush on food colouring to the kiwi slices? Buttermilk pancakes are fine and fluffy, whereas the same recipe when made using yogurt gives denser and heavier pancakes. The yield is also much lesser. very nice! 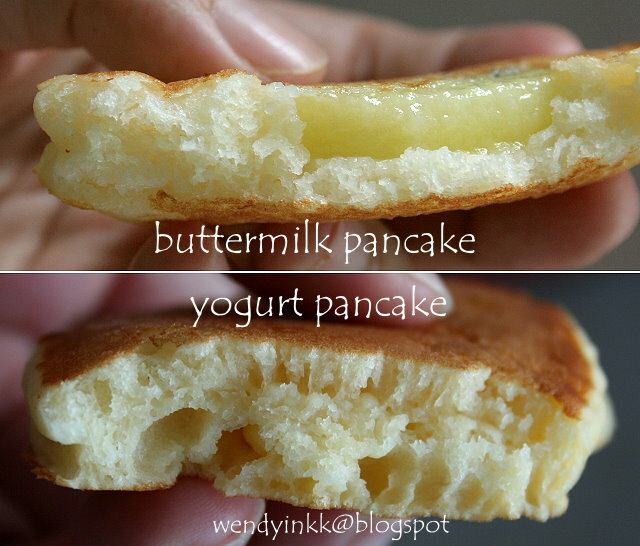 nampak sgt fluffy kan.. will try this one day tp kat tganu ni tak pernah jumpa lg buttermilk in packet gitu..
Wendy, your pancakes look so fluffy and light. 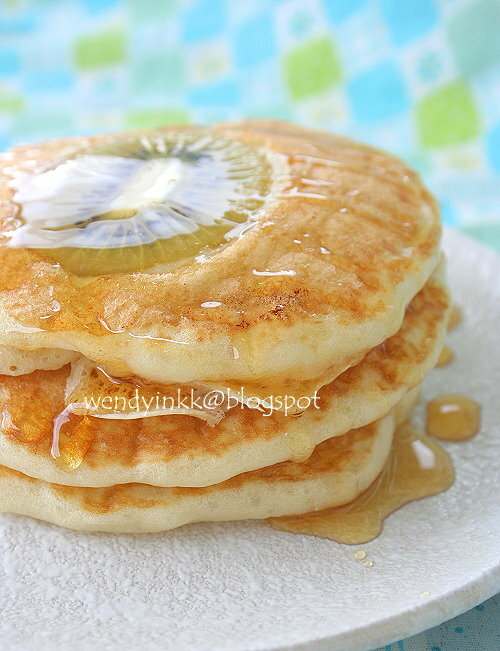 The addition of the kiwi made your pancakes look elegant. Thanks for sharing. That looks real fluffy indeed, I have not made pancakes for years! Even then, I used only premixed batter. Gotta try this too although I have not seen buttermilk in any stores here. They are very crispy and light on the inside and it's not supposed to tasted cakey. May i know what else could we do with buttermilk? Tesco dan sesetengah Jusco ada. Bake with yen got la. A good youtiao should never be cakey at all. I would never buy a cakey youtiao. You can keep it for a week. And make more pancakes. I think you will want to make more instead of just one batch. wow! the color and the texture so so nice! Eh, serious, try buttermilk, very diff de, no joke. Bake with Yen la... try there. Really fluffy like sponge cake. Now I know the story behind about the buttermilk. Thanks for the info. I always mixed milk with lemon. meaning I can substitute with buttermilk next time? My daughter loves chocolate chips pancake. My 1st piece will usually turn out smooth and nice but all the rest of my pancakes looked rough like flower on top. Can u pls advice, thank u. Love the photos showing the difference between the texture of buttermilk and yogurt ones, seeing is believing :)I normally add yogurt into mine, which I was already very happy with. 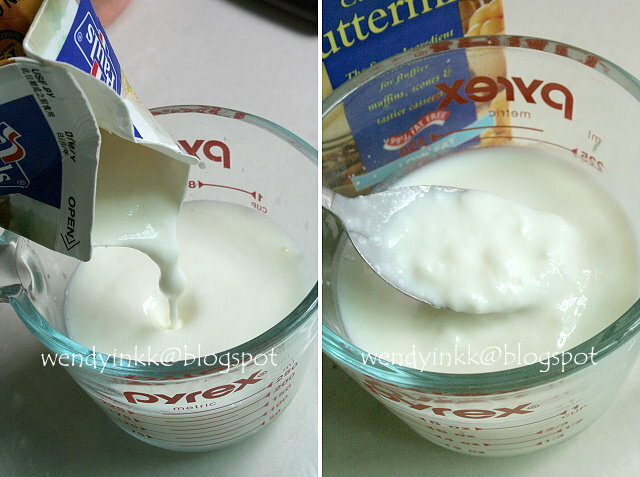 Never came across buttermilk in stores but I am totally convinced now, must try buttermilk. 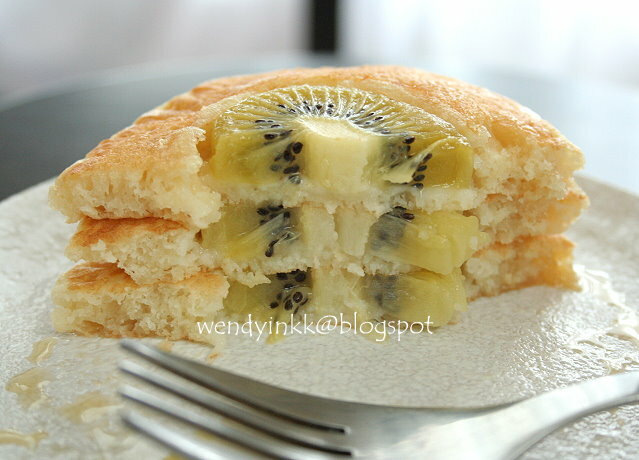 Your pancake looks so pretty with the slice of kiwi on top. Tis looks really appetizing and very pretty, reminds me of the aussie muffins that i love. Thanks for sharing, must learn how to make one day. oh, i remember you telling me and elin about the buttermilk pancakes that how fluffy it is . Now i can see it. Now can get buttermilk quite easily, just that have to get ready few recipes before buying the whole carton as i see their shelf life is quite short. Definitely trying this, but must make sure to grab buttermilk while gro-shopping this week. Or I might just go make a quick dash now? Hmm...temptations a tonne, whenever I drop by here lah, Wendy. Just kidding, thanks for sharing your wonderful recipes (as always!). The pancakes looks so soft and fluffy. I agree with you that store bought buttermilk are better than using homemade substitutes.